Moshi Moshi follows the simple traditions of Japanese food, and aims to use food that is locally sourced. Not only does this ensure the best in quality, it helps preserve local communities and cuts down 'food miles'. That is why Moshi Moshi has gone to a lot of trouble to find Chris Bean and his daughter, Lorna. Chris and Lorna have lived and worked in Cornwall all their lives, setting out every morning at dawn to fish for a wide variety of local fish such as seabass, mackerel, colourful wrasse (previously used for pot-bait! ), gurnards, red mullet, pollock, dog fish, spider crab and monkfish. 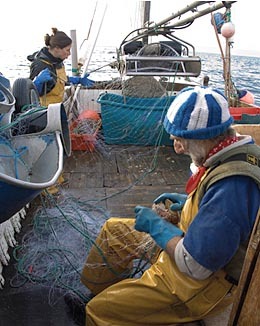 Hauling the fish up from a large-mesh gill net, they unravel each fish individually by hand, which requires precision and speed, strength and a lot of patience - but it's all worth it, because there's virtually no damage to the marine environment and the fish are in perfect condition. Because he fishes close to the shore, Chris can email us his catch of the day before lunch time, giving our chefs enough time to order for the next day. Chris then packs the fish in ice, sends them by road courier to reach Moshi Moshi by 9am the following day. And that, of course, is the other reason why we like Chris and Lorna: because they supply us with the freshest and best-quality fish anyone could wish for. You will not get better in Britain, at any price.